I made this blanket over the weekend for a coworker who is having a baby. It has a beautiful shell pattern, it is reversible and surprisingly thick. Perfect for the Fall and Winter. I used blue and cream but this blanket will look great with just about any color combination. I hope you have as much fun making your own as I did. Row 1: (shell row): With color A, chain 173. Work 1 dc in 5th ch from hook. 3 dc in next ch, 1 dc in next ch (shell completed). *skip 2 ch, work 1 dc in next ch, 3 dc in next ch, 1 dc in next ch. * Repeat from * to * across to ch just before last, do not work in last ch. Drop loop from hook, do not cut yarn. Do not turn. 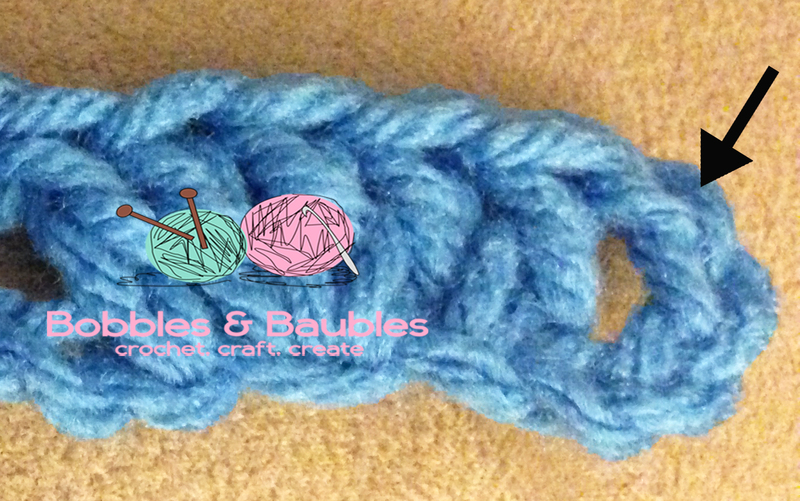 Row 2: (chain Loop Row) With color B. Starting at the beginning of last row (dropped loop from row 1 should be on opposite end), join B with sc in 4th ch of turning ch (the ch before 1st dc of first shell st row). * 5 dc in center st of shell (3rd dc) and in ch 6 loop. 5 dc in center st of next shell and ch 6 loop * Repeat from * to * across. Drop loop from hook. Do not cut yarn. Do not turn. Row 4: (Chain Loop Row) Pick up dropped color A at end of the shell st row before last. *ch 6. Working in front, skip shell. 1 sc in space between shells (in the same color shell)* Repeat from * to * across. Ch 6, skip last shell, 1 sc in chain loop row. Row 5: With color A, work same as for row 3. Do not turn. Row 6: Pick up dropped B loop at end of shell st row before last. Work same as for row 4. Repeat rows 3,4,5 & 6 for pattern. Work until length desired is reached. 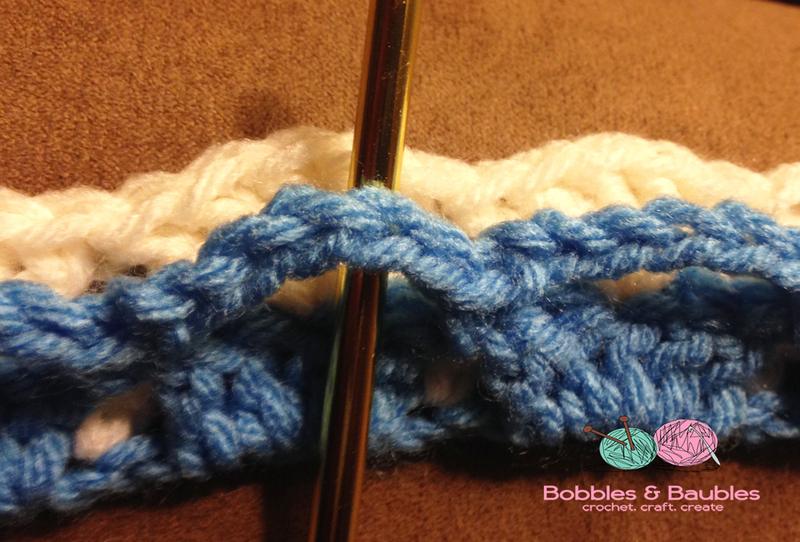 Border: *Double crochet in each st across. For corners: 2 dc, ch 2, 2 dc in same corner ch* Repeat from * to * once. Join with sl st.
How many foundation chains would you suggest for an adult sized blanket? I LOVE this pattern!! Thanks for sharing! I have made this pattern for babies and one for an adult but I don’t remember how many skeins of yarn needed for an adult size. Can you help? I cant seem to understand row 2 of the double sided baby blanket. Could I get a better explanation? It’s just not coming together in my brain. What are the dimensions of this blanket? I’d like to make it in a large adult size but have no idea of how much yarn to buy. If the dimensions were listed here I could figure it out. It’s a really pretty pattern and I’d like to do it soon. Thanks. Thanks so much for this pattern! A friend of my mother’s had shown me how to do this more than 16 years ago, and I’d made a baby blanket for my eldest, but had since forgotten how to do it. I’m so delighted to have found your pattern in time for my friend’s baby due in a month and a half. Hi Vanessa, I’m having a problem understanding the ending of each row. Can you please explain? I am very happy I found this pattern on your website. I made this blanket 32 years ago for my nephew and misplaced the pattern and have searched for it for years. I’m making one this week for a friend’s grandchild. Thanks you, I’m ecstatic. I love this pattern. Mum made this blanket years ago and is busy crotcheting again but she his having difficulty remembering how to crotchet back without turning. Can you help as she is 82. 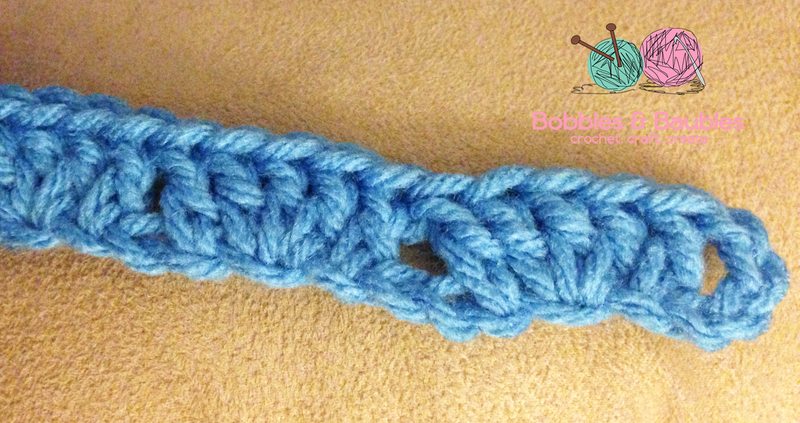 After I got the hang of the 2 repeating rows, this was quite easy to make and turned out beautiful. It took a lot more yarn than I expected, but since it is so thick, it is like making 2 blankets at once, so of course it uses more yarn. Thank you for the pattern, I am sure I will use it again. I’ve been searching for this patten for YEARS! I made several of these blankets in the 80’s and then lost the pattern. I’m so excited to have found it again. Thank you so much. Can’t wait to make one again! What gauge is needed to make this double sided baby blanket by Vanessa? I made it a few years ago but forget how big it it. I want to make a baby blanket. I have made this blanket for over 45 years, it is beautiful. It definitely is one of my favorites. Thanks for stopping by! I did chain 173 but this was way too long–so I cut it down to 137 chains-this gives me 27 shells across each row with the H size hook. I have been crocheting 35 years, but the pictures really helped me remember how this pattern goes together. Thanks for the really good pattern!!!! This is an update to my previous comment. After working about 8 rows, I realized the 27 shells made this baby blanket too long, it measured out at 37 inches long. So I refigured the blanket with 22 shells, which now measures to 30 inches. I am still using the H hook for this blanket. I would advise if you made the larger size of 137 chains, buy 4 skeins of each color. From what I could visually see, I was using quite a lot of yarn, so buy an extra skein of each color. Hope this helps for a smaller size blanket. I have made this pattern for a friend’s baby in pink and soft grey. Turned out beautiful. Now I want one for Me! Gonna do in blues. Thank you so much for sharing!